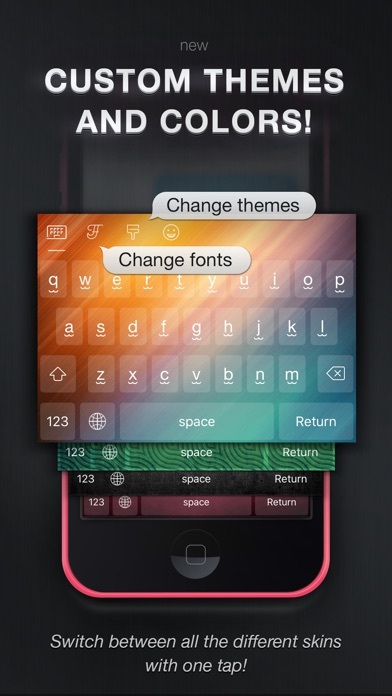 COOL FONTS NOW IN YOUR KEYBOARD... EVERYWHERE! 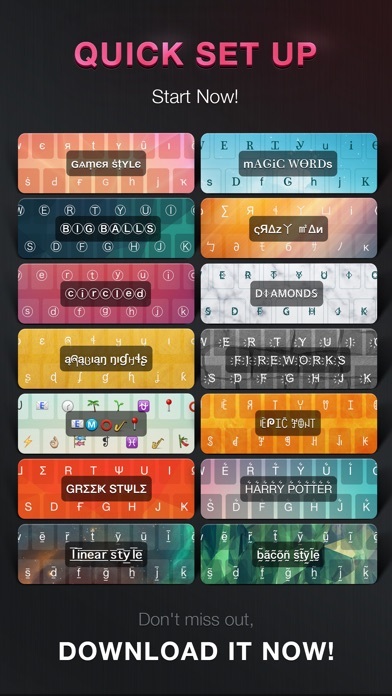 Discover the best custom keyboard for iOS, with tons of different fonts and themes to customize your apple device! DOZENS OF NEW THEMES AND FONTS ADDED! Over 10 MILLION PEOPLE use Cool Fonts on their iPhones, iPods and iPads! 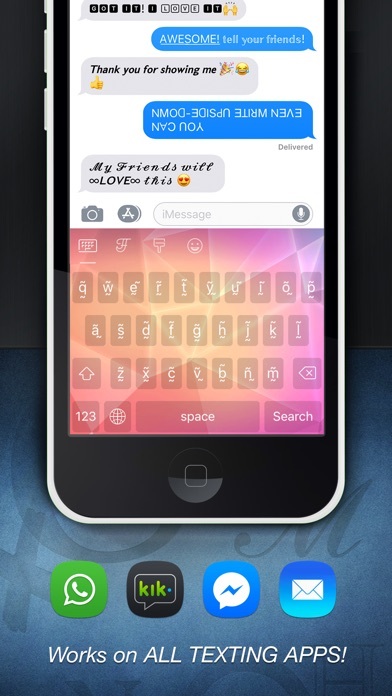 Customize your device with tons of different fonts that can be used everywhere you can type a message (Email, iMessage,, whatsapp, Line, Snapchat, WeChat, Kik ...) - ₡U$ŦØMłZE ¥ØUƦ PƦØ₣łŁE λ₦Ð BłØ Ø₦ $Ø₡łλŁ ₦EŦ₩ØƦƙ$ - ѕєи∂ ¢υтє тєχт мєѕѕαgєѕ тσ уσυя ѕє¢яєт ¢яυѕн - ⓟⓘⓜⓟ ⓤⓟ ⓨⓞⓤⓡ ⓐⓟⓟ ⓕⓞⓛⓓⓔⓡⓢ -AND MORE!!! (open the app to see) SPICE UP YOUR INSTAGRAM COMMENTS, SNAPCHAT AND INSTAGRAM STORIES, WRITE BETTER FACEBOOK STATUS MESSAGES AND GET MORE RETWEETS... IT WORKS ON ALL APPS! 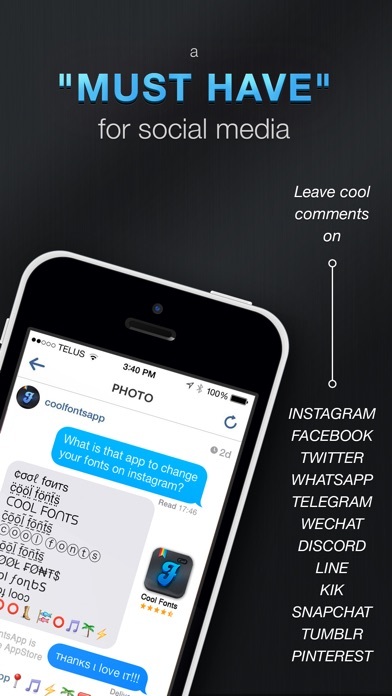 Be one of the first to get it and surprise your friends with a text message written in Cool Fonts ;) DOWNLOAD IT NOW! Want more fonts? 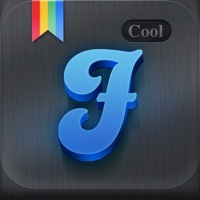 Become a Cool Fonts Premium user and enjoy all the best fonts including bold, cursive, italic, comic, sherif..., unlimited custom keyboards, amazing themes and a no ads! Cool Fonts Premium Subscription Information Joining Cool Fonts Premium enables a 3-day free trail, followed by a monthly membership fee. -Subscription automatically renews unless auto-renew is turned off at least 24-hours before the end of the current period -Account will be charged for renewal within 24-hours prior to the end of the current period -Subscriptions may be managed by the user and auto-renewal may be turned off by going to the user's Account Settings after purchase. -Any unused portion of a free trial period, if offered, will be forfeited when the user purchases a subscription to that publication, where applicable. To get all the package and it is still locked it keeps telling to upgrade to premium which I’ve done! How do I fix this?!? So this font app is amazing and I really recommend it. But there is one thing that needs to be fixed. There is an emoji feature on the keyboard and it worked for a few days but now it isn’t working anymore. Every time I press it it just doesn’t do anything ;(. And I feel like there should be more free fonts too. I also think the fonts should be $2.00 not $4.00. Thank you 💗I really love this app! And if there are any developers reading this please try to respond! Ridiculous one time fee... ok I would understand. But otherwise that’s lunacy. I liked the ide of this app so I decided it was worth the $5 a month. GUESS WHAT! I can’t use anything! I’m paying for the subscription but I’m not allowed to access the fonts! I bought the Pro version to see if I could get my font on their but alas, it only gives you the keyboard designs after it says that you will get all the fonts! SAD GIVE ME MY SUBSCRIPTION AND MONEY BACK FOR THE PRO VERSION! I’m just looking for a keyboard theme. The choices are lame with this app. I select the theme but it won’t carry over. Uninstalled. This app is amazing. And I would like to cover a few points just to prove my point. But before that, thank you creators of Cool Fonts. You listened to the people who left reviews and put a lot less ads in the app! Thank you so much! Anyway, now I will talk about the things that make this app so great. 1. Hardly any ads! I know I just thanked the creators for doing this, but this is one of the only font apps that hardly have any ads. And the ads this app plays are 3-10 seconds, unlike others that have 45 second ads. 2. A lot more than fonts! There are also faces that come with some fonts such as this one that I have been looking for a few months now: ( ͡° ͜ʖ ͡°) 3. Very customizable! 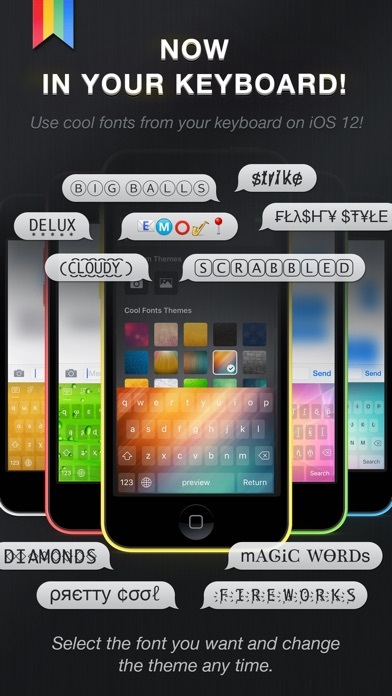 Not only can you write in cool fonts and joke around with funny faces, but you can customize your keyboard! This app has a lot to offer. I totally recommend this app. If your looking for a font app, then you should get this one because I promise, you will be impressed by how much you can do with it! Awesome fonts, many are free. You can always buy more if ya want. However, I’ve found no need to to this because they offer so many free and fun fonts for all occasions! User friendly, hasn’t affected my iPhone keyboard at all! Other font apps really jacked up my phone!! No adverse affects is a BIG BONUS and a MUST for anything I put on my pone. So if your wanting some new fun fonts I recommend this app! I love this is. It makes my phone less boring. Even though I don’t have a subscription, I can still get great themes. It’s soooo great and it’s free I mean who would hold back on that! му мσѕт fανσяιтє fσит αρρℓι¢αтισи!! this app is amazing!i love how it lets me buy new packs!